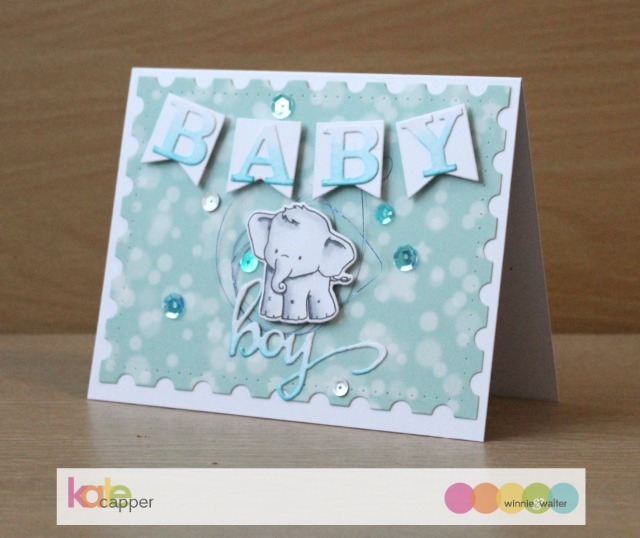 Today I have a cute baby card to share. 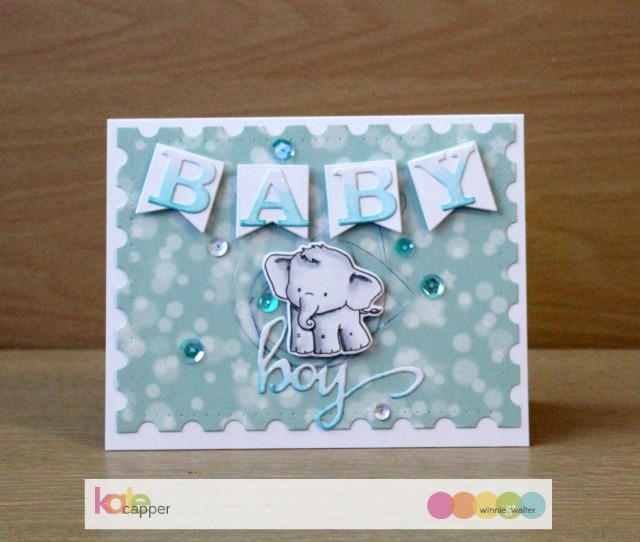 I'm having so much fun playing with the Welcome to the Family with Evelin T Designs stamp set. 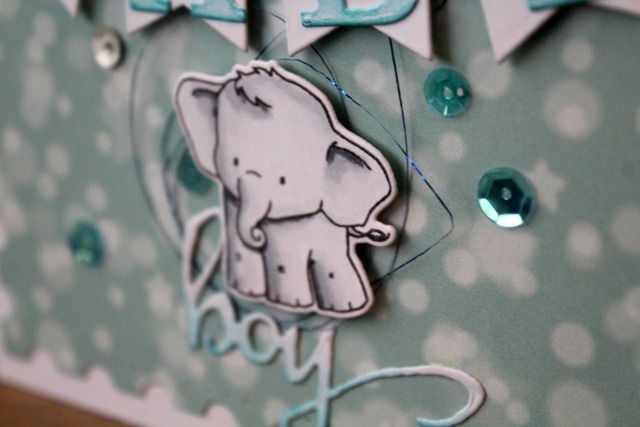 The elephants are a favourite and that's my starting point for this card. The elephant was stamped in black momento ink and coloured with copics. I then used the matching cutaways to die cut the image. I knew I wanted to make a baby card and everyone I know seems to be having boys so I chose some light blue patterned paper for my background. I used the Essentials: Lana Cutaways large die with the patterned paper. Then used one of the smaller dies for the banners. 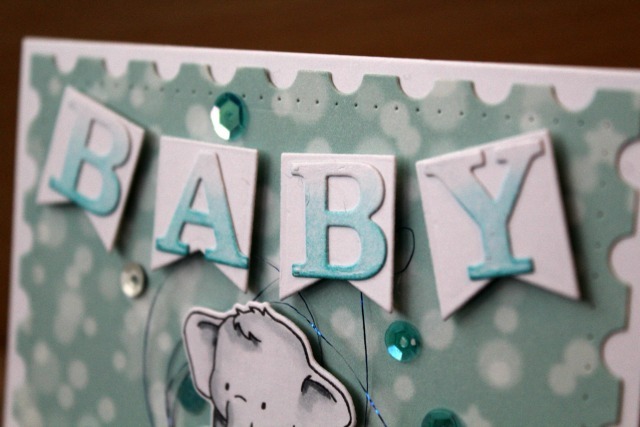 On the banners I have added the word "baby" by using the Typecast: Cary Letters Cutaways. Its just white card and I added some distress ink to the bottom of each letter to create a little contrast. Next I did the same but with the "boy" cutaway from The Big, the Bold and Baby Cutaways. The sentiment also has a covering of clear wink of stella. Once the banners were adhered in place on foam squares I added some metallic blue thread before placing the die cut elephant over the top to hold it n place. The finishing touch has to be sequins. Oh KATE! This is so sweet, you have inspired me to NO END! Just precious! it is such a cute card kate.